We went to Vegas for McKenzie's cheer Nationals. Just "the GIRLS" went......mom, Kenz, Kassie, Stella and me and Addy. We had such a great time. We watched LOTS of cheer, shopped at ton and layed out at the pool. Addy LOVED the girls trip. It was fun being with my mom and sisters, we have way too much fun together! Me and my girl and Nationals.....GO FUSION! We have way too much fun together! Thanks mom for such an incredible weekend. We are so lucky to have each other. I look forward to many more "Girls Trips...."
As if we don't have enough soccer in our lives, Kelly decides to join a soccer league 35+ (hehehe) with the guys in our neighborhood! They play every Wednesday night and they are actually pretty good! It has been fun for Kelly to get to play the game instead of watch (coach) from the sidelines. He has loved every minute of it! I know I said I would get better at blogging...........and now I am at least a month behind! I will try to catch up because we have been busy doing lots of fun things!!!! Over Presidents weekend in February both Riley and Brennan played in the Presidents Cup in St George. It was a busy weekend full of soccer. We left Addy home with my mom (thanks again) so it was just me, Kelly and the boys. We had the Best time. We played 7 games in 2 days! Brennan played in St George and Riley played in Mesquite so we got to know "The Canyon" very well. The boys had a blast hanging out with their team, swimming and of course playing amazing soccer. I love watching and cheering for our boys they are both such awesome players and they absolutely love the game. I LOVE being a soccer mom! My sweet Bronson was such a great sport all weekend. He was a little bored at this point! Love this boy too......I am such a proud mama! What do you do when it is cold outside? Head to SUNNY PHOENIX...... We planned a much needed mommy get away/ girls trip to visit Maria and her sweet family in Phoenix. It was the most amazing 3 days, we laughed so hard our sides hurt, we cried, we shopped and we ate and ate. We shopped and shopped and shopped. After a wonderful time in the Mesa Temple we went to this awesome restaurant called Joes....you eat outside on the patio in the warm sun. They have the yummiest food and the largest lemons I have ever seen. I asked for a lemon for my Diet Coke and this is what I got! 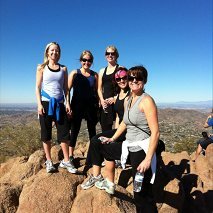 We hiked Camelback mountain. It was a beautiful day and 75 degrees. It was amazing. I think it was one of my favorite parts of trip. On top of Camelback. It was such an amazing hike and such a beautiful view on top. These ladies are amazing! Did I mention that we shopped? So much fun! This was our 2nd annual trip to the Bear River Lodge. My dad (Ken) started this tradition about 4 years ago, when he took us older kids and our spouses snowmobiling at Daniels Summit. It was fun but kind of hectic finding sitters for the kids and stressing about being away from them. So last year dad got a 5 bedroom cabin at the Bear River lodge and it was so much fun having all of our families there we decided to do that again. My dad looks forward to this trip more then anything else all year. He considers it our Christmas together. We have so much fun hanging out, eating, playing games, eating, snowmobiling, eating and just laughing. The cabin is HUGE and the kids just have a blast playing with their cousins. We love it! Lunch at McDonalds in Evanston, the kids loved the saddle seats! Noah LOVED the ride.....put him right to sleep! After our race we all headed back to the Houstons and had snacks and played games. It was such a fun memorable New Years we are excited to start 2012 and make many more memories with family and friends. Riley had a soccer tournament over the break. Riley did awesome and had lots of fun. Kelly even got to coach a game he thought that was awesome! Kaylix showing off his basketball skills! .Two Men and a Lil' Lady. I won a $100,000 Dream Wedding Giveaway!!! Kelly and I were married August of 97'. We have been married 11 wonderful years. We have 4 beautiful children whom we adore. Riley is 10, Brennan 7, Bronson 3 and our little Addyson is 4 months old. They are our pride and joy!